Soaked baked oatmeal is a staple in our home for our busy weekday mornings. If you make it up ahead of time, you can just place it right in the oven the morning you would like to eat it. It does take a little bit of planning ahead of time, but it is so worth it! You want to begin the recipe by soaking the steel cut oats in filtered water for at least 6 hours. The reason for soaking the oats is to get rid of the outer layer of phytic acid. Grains, nuts, and seeds each have a layer of phytic acid on them to protect themselves from the environment as they are growing. However, our digestive systems are not able to break down this phytic acid, which causes stress. Soaking the oatmeal allows the body to digest the grains more like a vegetable instead of a grain. It is also best to use steel cut oats versus the rolled oats, because they are less processed. If you are really excited to make this recipe and you have all the ingredients at home except for the steel cut oats, and you do have rolled oats, they are interchangeable in this recipe. There are a lot of options as far as fruit choices for the oatmeal. You can pick and choose any mixture of fresh apples, pears, bananas, peaches, and/or berries together, or get a frozen bag of berries and use that for an easier version. Dice the larger fruits into bite sized pieces. Soak the steel cut oats at least 6-8 hours or overnight, depending on when you prepare the recipe. Soak in a glass container so that oats are covered with 1-2 inches of water. Drain the oats in a colander and rinse them off with water. 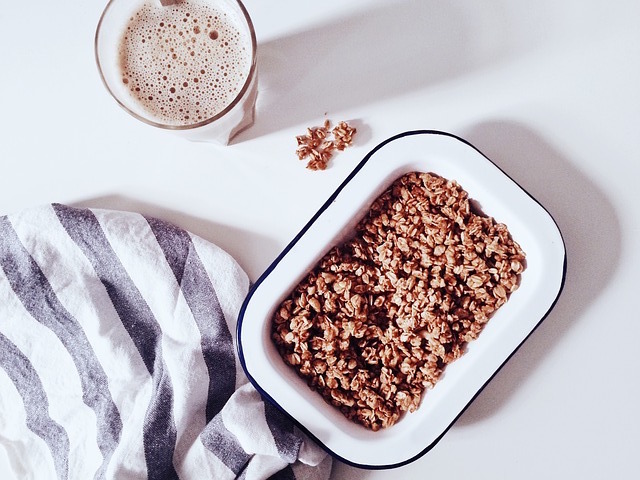 Shake as much water as possible out of the oats, and place them in a 9x13 pan. Stir your choice of fruit into the pan with the oats. In a separate bowl, mix together the eggs, milk, maple syrup, butter, and cinnamon; stir the mixture in with the oats. Bake for 45 minutes (an hour if it was stored in the fridge overnight). Serve with extra coconut/almond/raw milk, butter, and maple syrup if desired! Will be trying this…Thank you for sharing….! I take this to my grandchildren when I go to visit. Each time I visit, the first question they ask is, “did you make baked oatmeal?” Love it. It’s REALLY good.